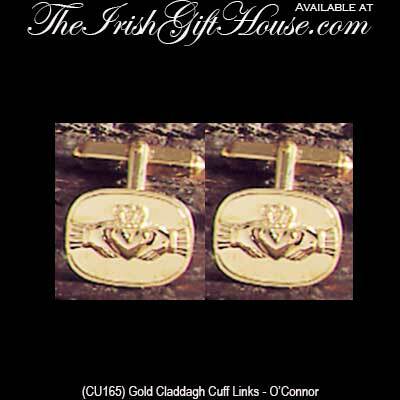 Gold Claddagh cuff links will show your Irish pride in the boardroom or in the ballroom. These Claddagh cuff links have been hallmarked 10K gold by the Irish Assay Office at Dublin Castle in Ireland. These 10ct gold Claddagh cuff links measures 3/4" wide x 1/2" tall and will accent both formal and business attire. The hinged Irish cuff links are made in Ireland by O'Connor Jewelry and are gift boxed with a Claddagh legend card, complements of The Irish Gift House. Claddagh cuff links are a gold plated design that are fashioned in a traditional motif. Claddagh cuff links are a traditional design that features a rhodium plated finish. Claddagh cuff links are crafted in sterling silver and feature a traditional design.